A long overdue review commitment is squeezed into a tightly packed mid-year vacation. I read Such is Life by Jeri Walker-Bickett with the distinct feeling that I am missing something that is staring me in the face. I suspect that my mind, steeped in academic learning for the past several months and feeling akin to a pickled gherkin removed from its saline solution, is not fit to attempt this task that involves being a reviewer in the real world of social media. The first read I act like a tourist in an art museum, my needs immediate and my expectancy urgent, waiting for a piece to strike an emotional cord so that I can take a mental snapshot of its noteworthy nature. Occasionally, the words flying at me coagulate into something more, then there is a brief leaping of the blood, a flush of recognition. But I struggle to stay involved, to feel what I know I’m supposed to feel; my head space is wrong. It’s at this point that I do some short story research, the idea being to come up with a solid scaffolding for judging the merits of short stories. I also look at the author’s notes on Such is Life and other reader and blogger reviews – and there are a great many to choose from since Jeri Walker-Bickett is a well-known blogger and writing teacher. I am entranced by Larry Crane’s excellent blog post (http://69.195.124.64/~mainelar/2013/02/02/review-of-such-is-life-jeri-walker-bickett/#axzz2YX5dV0PV) which throws a bright fresh light on Walker-Bickett’s deftly crafted collection as literary realism. From the other reviewers I gather that it’s okay to have a strong favourite in the collection, and between their fulsome enjoyment of Such is Life and Larry Crane I re-read the collection, more slowly this time, looking at each story with newly opened careful eyes. It works! I get into it this time. I begin to appreciate the sometimes unusual language constructs which lend colour, the local humour which adds authenticity, the distinctive nuances of plot, place and character and I get a good glimpse of what it is that is holding the characters back and what it is that they are looking for and desire so badly. I start to see each story as a different framed episode in a bigger frame; the four shorter stories framing the teacher-versus-writer story, acting as emanations from her rebellious pen. I grasp that it is this structure which frees Walker-Bickett to make no judgements – such is life, after all – but also to imply in a clear ringing tone (the teacher’s voice) that as hard as it might be, sometimes the only solution is to make a life choice which gets one closer to what one wants. “Not Terribly Important” is the centre-point around which the other stories rotate as misaligned planets (different tempo, different drama) might do. Each of the characters in the four varied encircling stories have choices to make which will determine if they break away from their claustrophobic circumstances or not. The teacher is the emblematic central character of the collection; only she makes the big break, deciding that she will do what gives her satisfaction and write with no restrictions, rather than teach. By rebelling against the narrow mentality of the Mormon community she ‘escapes’ and becomes a talisman for choosing a different fate. Interestingly, in what for me is the most moving story, “For the Love of Dog”, the main character shows no sign of planning to leave her claustrophobic marriage, and that is perhaps the source of my sadness, understanding that the dog is a momentary interlude of reciprocated love, and there is no possible cure for her loveless existence. It strikes me at some point that Such is Life is a worthy title – even if, indeed because there are other books with the same title which lend their own echoes of gravitas and wry humour. Such is Life implies nothing and everything about a few ordinary lives, lives that might easily appear small and unimportant if viewed from a zoomed-out perspective. But the power of Such is Life to affect readers comes from its zoomed-in perspective on the emotional jeopardy faced by each central protagonist. Walker-Bickett appears to have intimate knowledge of her characters’ dilemmas, telling their stories with delicate precision. I experience the pleasure of human kinship that bridges differences, as if the secret life of the artist has some tenuous extraordinary relation to my own inner life. After reading “Pretty Girl” I conclude that it takes a certain kind of bravery to have a Such is Life philosophy. By the end of “Not Very Important” I’m wondering at what point such a philosophy becomes counter-productive, encouraging lethargy and stasis rather than reaction and decision-taking? But Walker-Bickett allows for no easy answers, choosing her next two stories with care. The tragic situation that unfolds in “For the Love of Dog” suggests that death may provide some kind of a solution, or resolution, to our unseemly untidy emotions. My heart breaks for the dog’s distraught mistress. I reach “River Walk” with a strong sense of human fellowship; we are all in this together, a strange unscripted adventure that requires our participation and involvement. “River Walk” unsettles me. Is it a good decision to opt out when life can no longer be adequately lived? Walker-Bickett leaves this question open. I’m left with the finality of unresolved sadness: some will find it in themselves to change the circumstances which restrict and limit their lives and some will not; some will find a way to endure and some will not. “For the Love of Dog” hums quietly in my head; I consider it to be that rare pitch-perfect story, not a word too much or too little, not an emotion portrayed too sparingly or too excessively. 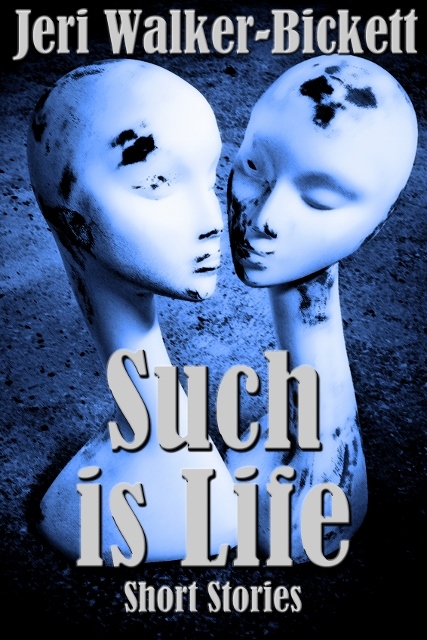 Such is Life, a collection of edgy and engaging stories about modern life, enlarges my worldview and shifts my perspective. What more can one ask?